Following the success that he achieved on his first dive into triathlon, 16-year old sportsman Luis Miguel "Igi" Maximo will give it another shot as he competes in the 1st Talisay Triathlon today in Talisay City. 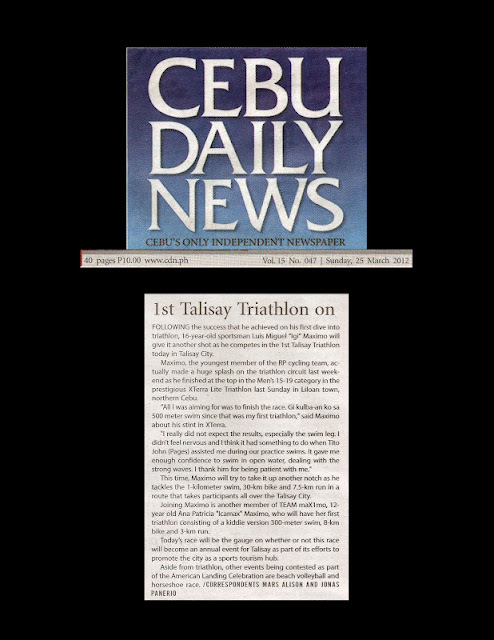 Maximo, the youngest member of the RP cycling team, actually made a huge splash on the triathlon circuit last weekend as he finished at the top in the Men's 15-19 category in the prestigious XTerra Lite Triathlon last Sunday in Liloan town, northern Cebu. "All I was aiming for was to finish the race. Gi kulba-an ko sa 500 meter swim since that was my first triathlon," said Maximo about his stint in Xterra. "I really did not expect the results, especially the swim leg. I didn't feel nervous and I think it had something to do when Tito John (Pages) assisted me during our practice swims. It gave me enough confidence to swim in open water, dealing with the strong waves. I thank him for being patient with me." This time Maximo will try to take it up another notch as he tackles the 1-kilometer swim, 30-km bike and 7.5-km run in a route that takes participants all over the Talisay City. Joining Maximo is another member of TEAM maX1mo, 12-year old Ana Patricia "Icamax" Maximo, who will have her first triathlon consisting of a kiddie version 300-meter swim, 8-km bike and 3-km run. Today's race will be the gauge on whether or not this race will become an annual event for Talisay as part of its efforts to promote the city as a sports tourism hub.